Being charged with the task of accessioning and supplying of living microbiological material, microbial culture collections are institutions that play a central role between the interests of a variety of user communities. On the one side are the providers of living microbiological material, such as individual scientists, institutions and countries of origin and on the other side are the various kinds of recipients/users of cultures of microorganisms from academia and industry. Thus, providing access to high quality biological material and scientific services while at the same time observing donor countries' rights, intellectual property rights, biosafety and biosecurity aspects poses demanding challenges. E.g. donor countries rights relate to Article 15 of the Convention on Biological Diversity: "Contracting parties …. recognize the sovereign rights of states over their natural resources …. shall facilitate access to resources … and not impose restrictions that run counter to the aims of the Convention. Access to natural resources shall be by mutually agreed terms and subject to prior informed consent ..." The use of a proposed standard contract by culture collections is discussed as a way of contractually safeguarding the existing research commons, while observing the new rights established in the Convention on Biological Diversity as well as other existing and new legislation impacting on the accessibility of living microbial material. Being charged with the task of accessioning and supplying living microbiological material, microbial culture collections are institutions that play a central role between the interests of a variety of user communities. On the one side are the providers of living microbiological material, such as the individual scientists, institutions and countries of origin and on the other side are the various kinds of recipients/users of cultures of microorganisms from academia and industry. Culture collections/BRCs also act as mediators of related up-to-date information and technology. Thus, providing access to high quality biological material and scientific services while at the same time observing donor countries’ rights, intellectual property rights, biosafety and biosecurity aspects poses demanding challenges. E.g. donor countries rights relate to Article 15 of the CBD: “Contracting parties … recognize the sovereign rights of states over their natural resources … shall facilitate access to resources … and not impose restrictions that run counter to the aims of the Convention. Access to natural resources shall be by mutually agreed terms and subject to prior informed consent …”. While, traditionally, service culture collections have kept various types of records for incoming and outgoing microbial resources, allowing the tracking of cultures, as well as information on their nature, no commonly applied procedures and conditions were agreed. The use of routine Material Transfer Agreements by culture collections has been debated for some time among the members of the European Culture Collections’ Organization and resulted in agreed core contents for a MTA to be used for the supply of cultures from service culture collections. This paper intends to provide first an overview on the scientific-technical and administrative-regulatory background which shapes and governs the daily work in service culture collections (defined here as collections of living, laboratory held, biological material) and which, after all, defined the final contents of the MTA. The scope of the MTA and definitions and wordings therein are then presented with a view to the aim of the ECCO membership to produce a core agreement which would address particular points of actions and requirements deemed central and imperative for all service culture collections and thus provide harmonized procedures for these. Concentrating on only a limited set of core items, which should be the least common denominator for the collections, it remains to each collection to define on top of this ECCO – MTA their own individual, additional terms of delivery and supply as deemed applicable in their particular environment. This MTA was designed with one main point in mind: to develop a common approach that would help to facilitate access to ex-situ held biological material in a legally sound environment, including the exchange between culture collections. In an era of globalization, harmonization of procedures and processes is an important way forward to further science and development, so that necessary regulations do not build up to form undue hindrances. Microorganisms are ubiquitous and found in every ecological niche, performing recycling roles and interacting with other living forms in ways that we are only beginning to understand. Their total numbers are unknown and their study in-situ is difficult. Microorganisms that are isolated from the environment are typically conserved in culture collections and form the basis of much of our knowledge of microbial diversity and are the living archival material for future study. The in-situ conservation is not applicable to microorganisms for a number of reasons. In contrast to higher plants and animals, microbial genetic resources replicate frequently. Consequently, this may lead to changing populations in the environment and also ex-situ in culture collections, if not expertly preserved. They cannot be accurately enumerated, thus an estimation of a ‘base line’ for inventorying purposes is not possible. Microorganisms are easily transferred across borders by wind, water, the movement of animals or humans and cannot be tracked and monitored conventionally. They are difficult to fingerprint for identity or non-identity checks. On the other hand, again in contrast to e.g. plants, they are unlikely to be depleted by sampling; however, the loss of hosts (plants or animals) could lead to the loss of dependent microbial species; examples are already known for fungi. With a view to global distribution and political borders, strains of one and the same microbial species have been recorded to occur in a number of geographical locations. Few species may occur in only one country. Isolates or strains within a species may show slight genetic variation (which may also e.g. depend on sampling time), therefore individual isolates are of considerable significance in terms of genetic expression. Microorganisms easily develop novel and valuable properties in response to environmental stress, this is one of the reasons why they may be found equally in ‘gene-rich’ countries as in ‘industrial’ regions. Finally, besides requiring taxonomic skills, the study of microorganisms requires extensive, special equipment and technologies. All these characteristics of microorganisms, together with the existing technical limitations and natural realities need to be taken into consideration when CBD issues such as Country of Origin or Access and Benefit Sharing regimes are discussed. An important characteristic of microorganisms impacting upon the work with them is the potential of some of them to cause harm to humans, animals, plants or the environment. According to the potential risk associated they are classified into risk groups and/or governed by quarantine, sanitary, import and export regulations. As one of the most comprehensive examples the EU Risk Group allocation (EC Directive 93/88/EEC, with a view to harm to humans, listing risk groups 2, 3 and 4) of bacteria and fungi is presented here. EU member countries may decide to allocate a particular organism to a higher risk group than indicated in the EU Directive but not to a lower one. It can be seen that for bacteria and fungi the largest percentages are covered by those organisms with no or only minor harmful potential. 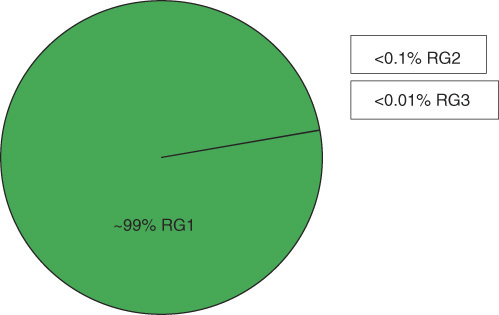 Only <1% (Bacteria, Figure 1) and <0.01% (Fungi, Figure 2) are allocated to the pathogenic group RG3. Of these organisms, none are classified in RG4. Interestingly, in the case of the high risk bearing Risk Group 3 or 4 organisms there is, in the EU and worldwide, consensus on how to handle these. More difficult, from the point of view of service collections, is the situation with those organisms allocated in Europe to Risk Group 2 – a quite diverse group of organisms – where the classification of some of them is (as indicated above) handled differently in the various countries. This results in quite differing demands for the mode of packaging, administrative paper work, accompanying documentation, etc., depending on sender’s and recipient’s countries. Such differing demands place heavy administrative burdens on service culture collections and slow down or even impede delivery/supply of biological material. Microorganisms have an endless array of capabilities ranging from the degradation of compounds to the synthesis of secondary metabolites. Applications for countless processes, experiments and all sorts of ‘situations’ can be listed. Be it enzymes such as those found in the group of aerobic endo-spore forming bacteria, be it their spores themselves which can be applied in such diverse fields as agriculture or human health. Microorganisms play a major role in providing basic material for the development of pharmaceutical drugs, in biotechnology, for bioremediation and bio-control agents, food and drink, toiletries and products for a number of other industries. It has proved difficult to estimate the value of these resources but, as an example, the estimated annual global market for products basing on biological resources in these branches reaches 500–800 Mrd US$ (TenKate and Laird 1999). Finally, one should not forget the immense role that microorganisms play in the environment with their diverse abilities to either degrade or synthesize a wide range of compounds. Nutrient cycles would not function without microbes at the basis of the transformation chain, and ultimately, the fertility of soil, the climate and our life depend on them. The aims and scopes and the practical work of service collections of living biological material revolve around accessioning and distributing living biological material for research and development. Some serve additionally as depositaries for patent cultures. Through their service side of work they provide continuity for academic and industrial research. At the same time, they add value to the biological material deposited (and thus to the related research) in that the material is properly conserved and supplied and often they carry out own research on the material. Figure 3 illustrates the various laws and regulations governing the work in microbial collections and the diverse fields of application for the biological material. 3.1. Cultures of MGRs in collections: what knowledge do collections store, what do collections do with the deposited biological material? Typically microbial genetic resources are isolated and identified (if not sent in by a depositor), or authenticated, possibly studied additionally, deposited, maintained/conserved and subsequently distributed to the user community. Each MGR held in a culture collection is allocated a unique identifying code; this ‘strain identifier’ remains constant even in case of taxonomic changes. Records of depositors, taxonomic information and other properties have usually always been kept for scientific reasons, as well as records of recipients of biological material for legal reasons. Additional information, such as the person(s) involved in the isolation and identification, the date of isolation, the country of origin, etc. is routinely recorded since 1993, the date of coming into force of the CBD. Before that date this information may not always be available. Records in service collections are usually more complete than those of in-house research collections. Information concerning the biological material provided by the depositor and published in literature is usually made available to the public from the collections’ catalogues or homepages together with information on how to grow the organisms. This is one of the scientific services rendered by service culture collections. In contrast to the biological material listed in the publicly accessible catalogue collections, information on the biological material deposited in connection with patent applications is sparse. MGRs have to be deposited for full disclosure of an invention when patent protection is sought for a product or process. In these cases, the organisms are not always completely identified, patent law normally does not ask for taxonomic identification. However, as a depositary may need to know with what they work, e.g. for safety reasons, some basic information is supplied to them. Other pieces of information, such as country of origin, source of isolation, date of isolation, isolator, etc. are usually not indicated. To date, the European Patent Law does not require this information to be included in the patent documentation (EU Directive 98/44/EC), but e.g. the Norwegian Patent Law (Norwegian Patents Act, Section 8 b.) does require information on the country of origin or the providing country and on the obtained prior consent. Biological material deposited for patent purposes is supplied only according to applicable patent regulations (internationally, this is the Budapest Treaty; nationally individual national patent law applies). This embraces e.g. not being available before publication of documents; after publication being available only according to certain administrative processes. When samples are delivered to entitled parties, a notification is sent to the depositor. All information provided to the depositary is held strictly confidential by the depositary unless release of information is explicitly allowed by the patent regulations. The status of International Depositary Authority (IDA) according to the Budapest Treaty requires recognition through WIPO and involves high organizational requirements for the culture collections holding this status. Most restrictions to availability of the biological material and information usually apply in dependency from the life of the patent. More details on the handling of patent deposits in culture collections may be found in older literature (e.g. Fritze 1994; Fritze and Weihs 2000; Fritze and Weihs 2001). Reconciling scientific and increasing regulatory demands is a topic that is stirring the minds not only in the collection community but in the scientific community in general. However, as usual, those institutions which stand in the midst of public visibility, such as collections of living biological material, are under greater pressure to react to those requirements and challenges than most of their end users; and for many of them a series of vital questions follows: How to meet the emerging challenges? What does the scientific user communities and what do governments expect from service culture collections? Today, culture collections have to face the problem of illegitimate or dishonest users – but even the legitimate users are often not easy to define or recognize. International/global legislation, even regional legislation on the handling of biological material is diverse, sometimes lacking or incomplete, or contradictory. The international nature of the services that culture collections provide requires harmonized approaches to compliance with regulations. While it seems clear to expect culture collections to know about and to follow all relevant regulations – too often it seems that the user community does not feel addressed themselves by these regulations. However, it is clear that users often act not only as recipients but also as providers of biological material: think of a university lab where it is quite normal to innocently ‘donate’ cultures to a neighbour laboratory. Existing measures for biosafety and – not least – the knowledge that such measures exist, provide the basis for any emerging biosafety/biosecurity discussion and development. A well-known source is the World Health Organization. Their WHO Laboratory Safety Manual (3rd ed. 2004; WHO/CDS/CSR/LYO/2004.11) is a valuable background information document for any work with biological material. More recently WHO published the WHO Biorisk Management Laboratory Biosecurity Guidance (2006, WHO/CDS/EPR/2006.6). Transport and packaging of living biological material is governed by various national, regional and global legislations. E.g. Accord Européen Relatif au Transport International des Merchandises Dangereuses par Routes (EU ADR) or UPU Regulations for Postal Services. The shipping of potentially hazardous materials are internationally covered by the IATA Dangerous Goods Regulations (IATA 2005). If respective cultures are not packed adequately, the shipper may be faced with drastic penalties. Each country or region may have their import/quarantine regulations of relevance to their valuable agricultural products, be it crops or livestock. Widely accepted Risk Group allocation for microorganisms (RG 1–4) has been done on the basis of potential harm to human workers. While in the EU document EC Directive 93/88/EEC on Biological Agents, only RG 2–4 are listed, the German Brochure ‘Merkblatt Sichere Biotechnologie’ (Note on Safe Biotechnology), not only lists all 4 RGs, but also abundant information is provided on potential pathogenicity to e.g. fish or insects (in particular bees), cloven-hoofed animals, plants, etc. Additionally, general information on how to assess the risk associated with a particular organism is presented. Particular handling permits are required for the various kinds of hazardous organisms and microbial culture collections must promote a sense of security in order to reduce the probability that dangerous biological material is obtained by unauthorized persons. Coming with this is also a duty of care to perform risk assessments. Unfortunately, in the academic circles, this sense of security is often missing, and knowledge and acceptance of the various regulatory requirements even in the classical field of biosafety is low. And it should be kept in mind that many of those laws and guidance established under the term ‘biosafety’, also widely cover the area of ‘biosecurity’; such as the release of dangerous biomaterial within the EU is regulated for some time through the EU Dual-use legislation (EU Council Regulation 3381/94/EEC). A European Bio-Preparedness Workshop (hosted by EuropaBio, Brussels, September 2007) had the main objective to provide input to the EU Commission for the Green Paper on Bio-Preparedness (COM(2007)399 final) which will have a strong impact on all institutions working with living biological materials. Transport, traceability, import, export and the dual-use aspects of biological materials are key issues of the discussion. Large parts of the scientific community have been criticising the approach of putting even more regulations in place as the biosecurity risk seems neglectable. On the other hand, biosecurity measures are regarded as preventive and harmonised European or international rules seem desirable especially for the higher risk groups of microorganisms. A consultation process has been started by the EU Commission in order to weigh different approaches towards a European Bio-Network as an advisory structure on biopreparedness. Input was given from the collections’ side to the CEN Laboratory Biorisk Management Standard Document (CEN/WS 31 N28) through WFCC and individual national routes. This reflects the status quo of an international initiative on setting rules for implementation of best practice in the area of biosafety and biosecurity. Following a consultation period, the standard document was agreed by a consensus procedure at the third and last plenary workshop (WS 31, 28/29 November 2007, Brussels). The resulting CEN Workshop Agreement (CWA 15793:2008) has a voluntary status. The document may be used as a guidance for auditing and certification processes and it may support the WHO laboratory guidelines mentioned above. It is performance-based and does not deliver technical elements avoiding citation of legislation or regulations. After a period of three years a new decision will be taken on either transforming the document into a CEN standard, or entering it into the ISO frame or to possibly withdraw it again. A more recent relevant activity, administered through the OECD by a special Task Force on Biological Resource Centres, has as its aim the transition of traditional microbial culture collections to biological resource centres to meet the academic and industrial communities’ needs in the 21st century. One key element in this was the development of Guidelines relating to biosecurity in the work of BRCs. The agreed biosecurity document has been declassified and became officially available by early 2007 and is part of the complete OECD Best Practice Guidelines (BIO(2007)9FINAL.pdf). The guidance relates to all bio-material domains and reflects the inherent dual-use potential of bio-material and its information. It nevertheless seeks the balance between “promoting scientific openness and a sense of security” and tries to deliver a “balanced and mutually reinforcing effect”. The emerging biosecurity debate needs to be accompanied by the expert knowledge available in collections and the academic community as well, as, in the end, their research work will be influenced as well. Such legislation is being developed and in the EU efforts are being made to be able to react on a common EU level. These will have a major impact on collections, the work of which vitally depends upon international exchange. It would certainly be sensible, before developing new regulations, to first review existing legislation that is relevant to biosafety and biosecurity. Here, the outcomes of previous cooperations between European culture collections, such as CABRI (Common Access to Biological Resources and Information, www.cabri.org) and EBRCN (European Biological Resource Centre Network, www.ebrcn.org) could prove useful. How should ex-situ collections tackle the issue of acquiring new material? How do the access provisions of the Convention on Biological Diversity affect scientists in their day-to-day work? How should ex-situ collections respond to the need to define rights and responsibilities of source countries, managers of collections and the academic and corporate scientists using them? How should ex-situ collections tackle the issue of supply of material to others and the relating terms of delivery? All Articles contain a statement saying that contracting parties agree to support the aims of each Article ‘as far as possible and as appropriate’ allowing room for flexibility depending on national circumstances. Each Article also includes a statement indicating the special needs of developing countries. In the following only those Articles are listed, which are of particular relevance to microbiology and culture collections. The relevant terms or wordings have been additionally highlighted. Article 1. … the objectives of the convention are the conservation of biological diversity, the sustainable use of its components and the fair and equitable sharing of the benefits arising from the utilization of biological resources. Article 7. … shall identify and monitor components of biological diversity important for its conservation; identify activities likely to have an adverse impact on conservation and monitor their effects; maintain and organize data derived from these activities. Article 9. … shall complement in situ conservation by establishing and maintaining facilities for ex situ conservation and research on plants, animals and microorganisms; manage ex situ conservation so that resources are not threatened; cooperate in financial and other support for ex situ conservation, and in the establishment of facilities in developing countries. Article 12. … shall establish and maintain programmes for scientific training and research that contribute to the conservation and sustainable use of biodiversity. Article 15. … have the sovereign right to decide on access to their natural resources. Restrictions should not run counter to the aims of the convention. Access shall be by mutually agreed terms (MAT) and subject to prior informed consent (PIC). Article 16. … undertake to provide/facilitate access to and transfer of relevant technology for the conservation and sustainable use of biological diversity, without causing damage to the environment. Terms of access shall recognize and be consistent with the protection of intellectual property rights. Article 17. … shall encourage the exchange of information from all publicly available sources, where possible repatriation of information. Article 18. … shall promote international technical and scientific cooperation. Article 19. … shall enable participation in biotechnological research, where possible in the countries of origin of the biological material. Modalities shall be developed for the safe transfer and handling of living modified organisms. Article 15 of the CBD has exerted the strongest impact on microbiology and the work of Culture Collections. Article 15 is the one that has brought about the discussion on material transfer agreements. It covers the greatest change to previously held attitudes: It sets aside the principle of ‘common heritage’ (in the sense of not being monopolized for the benefit of one state or group of states alone, but being treated as if to be used to the benefit of all mankind; and in the sense of common resources, free for the taking), previously widely adopted and in its place accepts sovereign rights of states to their natural resources. However, this article does not immediately grant property rights to the state; the question of ownership of genetic resources remains subject to national law. On the other hand, however, in the microbiological area, from the scientists’ side, this has given rise to discussions: Who might own a particular culture? Is it the isolator or depositor? The collection(s)? The user(s) having bought it? Subcultures of a given organism may be simultaneously in many hands and the problem of ‘multiple ownership’ of cultures is being debated (Figure 4). The answer must be somewhere between all or none of these. It is the view of most collections that no one person or entity can “own” a microbial culture. Rather, the vials containing a microbial culture obtained by the clients is theirs to use within permissible limits, they may “own” the contents of the vial subject to certain restrictions. Neither does an individual collection “own” a microbial culture – it may be deposited in several different collections. It is not possible that several individuals and institutions all lay claim to “ownership” on the same culture. Most collections see themselves as custodians of the strain with a right or “license” to reproduce copies for distribution and add data through research. All aspects of service culture collection work, from the accessioning of biological material to its authentication, its preservation and maintenance, through to its ultimate release to the scientific user community, underlie an array of rules and regulations. These have been and are being established on the international, regional or national level and, inherently, there is often lack of harmonization. However, the tasks of microbial collections do not end at their own countries’ borders and in consequence, microbial culture collections have organized themselves globally in the WFCC (World Federation for Culture Collections) and regionally, such as in ECCO (European Culture Collections’ Organization), initiating their own activities or contributing to efforts concerning bio-legislation to provide information and to increase communication for a better understanding of the rules. Not least, the WFCC has developed a database system in the World Data Centre for Microorganisms where its members are registered through a unique acronym and numerical identifier in its official list and is urging them to catalogue their microbiological resources. This system allows the tracking of microbiological items which must be possible with a view to the requirement of Access and Benefit Sharing of the CBD. In 1996, a WFCC Information Document (Access to ex-situ Microbial Genetic Resources within the Framework to the Convention on Biological Diversity) was produced as a Background Document to the UNEP/CBD/COP/3/Inf. 19 information document. This tried to convey to governments, policy makers and microbiologists issues relating to access to ex-situ microbial genetic resources. A survey of some 500 culture collections worldwide was provided giving an account on their role, organizational and administrative regimes, distribution policies and access practices. Information was provided on the special characteristics of microorganisms that distinguish them from plants and animals and the consequences of such characteristics for inventorying, tracking and benefit sharing. Existing relevant legislation and operating practices were summarised and policy issues addressed. Among a series of recommendations given was e.g. that access to ex-situ microbial genetic resources should remain unimpeded for the purposes of scientific research, industrial application, education and health care. Another item related to the development of a voluntary code of conduct for the introduction of access and benefit sharing procedures (http://wdcm.nig.ac.jp/wfcc/InfoDoc.html). More recently the MOSAICC project (Micro-organism Sustainable Use and Access Regulation International Code of Conduct) took up the recommendation from the previous publication and continued the work on the development of operational guidelines for the introduction of access and benefit sharing procedures. It took into consideration the CBD requirements that (1) Prior Informed Consent (PIC) should be obtained before collection of genetic resources and their deposit in a resource centre and (2) that terms should be defined at the time of deposit which will cover distribution to third parties. Model Material Acquisition Agreements and model Material Transfer Agreements have been developed with respect to microbial cultures for the use of culture collections as well as of research scientists in their role of depositors or recipients of cultures (http://www.belspo.be/bccm/mosaicc). While being highly useful, these documents require constant up-dating to be of effective actual help above a purely informative character. Although most collections take on the role of research institutions, indeed they are often integrated into universities and are thus used to a more flexible, open approach to the handling of cultures of microorganisms, they had to respond to the increasing legal requirements and had to take their own legal position, not least to protect themselves from law-suits and prosecution. Traditionally most collections have developed some kind of conditions of sale or supply relating e.g. to bureaucratic issues such as acceptance of terms, prices, delivery/loss in transit, banking details, terms of payment or general responsibilities. Some have gone into more detail looking at the transfer of biological materials and have added items such as purchasers or collections rights and responsibilities, restrictions of transfer, intellectual property, limit to uses (e.g. safe deposits, individual depositors’ conditions), safety, including information on handling, limitations of liabilities or commercial vs. academic usage. More recently the requirements of the Convention on Biological Diversity are considered and issues such as prior informed consent, information on country of origin, transfer agreements, restrictions of use (if any), obligations of end user to benefit sharing and responsibilities of involved parties are taken into consideration by individual collections. However, within the ECCO membership the understanding grew that a level of uniformity of actions among collections with regard to legal requirements was desirable. Taking the various aspects of responsibilities of BRCs into account and the obvious need for harmonized approaches, an ECCO working group was formed in 2005 to develop a document that would cover all relevant aspects that apply when a sample of a biological material is supplied by a culture collection to a recipient. Under the coordinating leadership of Dr. Danielle Janssens, BCCM-LMG, this group worked on the development of a document that would show to all parties involved, that all important issues with regard to the availability and use of the material are handled in the same way by the many different European collections, and that variation in handling between culture collections would concern only minor aspects. It was not unanimous from the beginning whether such a separate document was needed. The term of ‘MTA’ Material Transfer Agreement was coined only recently and many of the types of records kept at collections would have met the definition of an MTA. What purpose shall an MTA serve? What does the CBD expect? Do service CCs need an explicit MTA to serve the spirit of the CBD? What is already covered by existing documentation and procedures: catalogues, lists, order forms, accession forms, delivery slips, conditions of sale and delivery, etc.? Can there be a solution in the case of restrictions imposed on exchange for bacterial type strains which have a very specific use? What kind of experience have CCs had with their existing MTAs? However, discussions resolved that it was deemed necessary to agree to common definitions and procedures, not least with the aim to facilitate exchange of biological material among collections. Thus, taking into consideration the varied nature of collections in their development and with a view to holdings, scope, parent bodies and financial dependencies it was agreed that the ECCO MTA should be developed to form a basic core agreement on key issues, to which the individual collection could add its own specific requirements. These aspects were taken into account with a view to the recipients of samples of biological material: their entitlement to receive samples, their being informed on potential risks associated with samples, their responsibilities when handling these samples. Transparency of the movements of microbiological resources between source country and end use is central to the requirements of the CBD, for safeguarding individual collections as well as for securing countries’ access and benefit sharing (ABS) rights. The core reason for the existence of culture collections is to provide access to high quality biological resources and validated information. Collections maintain and supply authentic materials that are preserved in a stable condition and they make them available for long-term use, ensuring continuity. Once materials move away from such an environment there is the possibility of strain drift, contamination or replacement of the strain. It must be ensured that the scientific user community receives high quality materials on which to base their research and that donors have their investments protected. Here the rights of the country of origin are concerned according to the CBD, and rights of the institutions entitled to be involved. At the same time free use for research purposes is stated. Possibly, this part of the document needs to foresee amendments that might be triggered from the COP 10 (Japan, 2010) decisions towards ABS. COP 9 advocated a road map to ‘sectoral’ approaches to ABS and – depending on how ‘sectoral’ will be defined – this will heavily impact on the microbiological sectors. The main point here is to inform recipients of biological material that they have no immediate rights to the received material other than working with it. It does not discuss the issue of generating further intellectual property. The length of discussions spent on careful definitions of the terms used in the document reflect the special difficulties that arise when natural scientists have to deal with legal issues, the general difficulty to agree on meanings of terms, especially in an international environment and the common understanding of the importance of the issues and their consequences. RECIPIENT: The party to whom the COLLECTION sends the MATERIAL. In case this is not the END-USER but an INTERMEDIARY, this INTERMEDIARY agrees (i) to forward to the END-USER the present MTA and the MATERIAL in unchanged form and quantity as received from the COLLECTION, and (ii) to use for this further shipping the proper packaging, a trained shipper, and an authorized carrier, according to the applicable laws and regulations. To be able to define the sphere of action of this MTA, it was then as well felt necessary to define what the term material would embrace. The listed individual (sub)terms were further on explained in more detail. MATERIAL: ORIGINAL MATERIAL, PROGENY and UNMODIFIED DERIVATIVES. The MATERIAL shall not include MODIFICATIONS. LEGITIMATE EXCHANGE: The transfer of the MATERIAL between scientists working in the same Laboratory, or between partners in different Institutions collaborating on a defined joint project, for non-commercial purposes. This also includes the transfer of MATERIAL between public service culture collections/BRCs for accession purposes, provided the further distribution by the receiving collection/BRC is under MTA conditions equivalent and compatible to those in place at the supplying collection. 3. RECIPIENT agrees that any handling or other activity undertaken in their laboratory with the MATERIAL will be conducted under their responsibility and in compliance with all applicable laws and regulations. 4. RECIPIENT therefore assures that within their laboratory (i) access to the MATERIAL will be restricted to personnel capable and qualified to safely handle said MATERIAL and (ii) RECIPIENT shall exercise the necessary care, taking into account the specific characteristics of the MATERIAL, to maintain and use it with appropriate precautions to minimize any risk of harm to persons, property, and the environment, and to safeguard it from theft or misuse. On the side of the providing collection lies the responsibility for the quality of the provided material. Thus, a clause is included that the collection undertakes to guarantee certain properties of the material within limits. 10. The COLLECTION hereby assures within the scope of its quality system and as far as can be determined through the COLLECTION’s test regimes, that the MATERIAL shall be viable and pure upon shipment from the COLLECTION. An array of legal requirements governing the work with, the transborder movements of, and the use of, living microbial material exist – and some may differ considerably worldwide. Long standing attempts of the microbial culture collection communities to approach common procedures against this background have helped to provide a framework to underpin scientific research. In particular, the issues of the CBD are recognized and, e.g. the WFCC continues to work towards the development of a balanced system as described in its paper to COP9 (Smith and Desmeth 2007). Within ECCO, a Material Transfer Agreement (www.eccosite.org) has been negotiated that covers core aspects of the flow of biological material from a collection to a recipient. It concentrates on commonalities between the different collections and leaves the opportunity for collection-specific additional requirements. Particular attention is given to ensure that the exchange of materials is not unduly restricted. While this agreement pays due attention to the challenges of illegitimate or unlicensed duplication or commercialization by third parties (items 5, 6 and 7 of the MTA clearly state the recipient’s limitations in use and handling of the biological material), its main goal is the legitimate exchange of biological material for research and application. In particular, the document states explicitly the facilitated exchange of biological material between collections that agree to and share this document. The issue of access and benefit sharing received full attention at COP 9 where a road map to so called ‘sectoral approaches to ABS’ was suggested with the aim to present respective results to COP 10 in 2010 in Japan. The WFCC, in its paper ‘Access and Benefit Sharing, a Microorganism Perspective (WFCC 2008) presents the issue from the microbiological and, in particular, from the service culture collections viewpoint. It is intended to share the ECCO – MTA and offer it for the discussions in the microbial approach to ABS to help deliver workable, practical procedures for all parties involved. Recently, the microbiological views have been put forward in conjunction with the WFCC and presented at an ABS workshop arranged by the Japan Bioindustry Association (JBA) and UN University, Institute of Advanced Studies, as part of the preparations for Japan to host COP10. The Demonstration Project for a GBRCN (Global Biological Resource Centres Network), the most recent networking activity of microbial culture collections, has as its major goal the establishment of a legal operational framework for the exchange of materials and information and as such will offer a forum and play a major role in developing a microorganism approach to implementing an ABS regime. COBRICommon access to biological resources and information; www.cabri.org. CEN2008. CEN workshop agreement CWA 15793:2008. Convention on Biological Diversity1994. UNEP/CBD/94/1, 94-04228. Convention on Biological Diversity2000. Cartagena protocol on biosafety (entered into force 2003). Convention on Biological Diversity2002. Bonn guidelines on access to genetic resources and fair and equitable sharing of the benefits arising out of their utilization/ CBD Decision V/26. Decision V/26: Access to genetic resources. Available: www.biodiv.org/decisions/. EBRCNEuropean Biological Resource Centre Network, www.ebrcn.org. ECCO – The European Culture Collections’ Organization (www.eccosite.org). EU Accord Européen Relatif au Transport International des Marchandises Dangereuses par Routes (ADR). EU Council Regulation 3381/94/EEC on the Control of Exports of Dual-Use Goods from the Community. EU Directive 98/44/EC of the European Parliament and of the Council of 6 July 1998 on the legal protection of biotechnological inventions. EU EC Directive 93/88/EEC on Biological Agents. EU Green paper on bio-preparedness (COM(2007)399 final). Fritze, D , ; Patent aspects of the convention on biological diversity at the microbial level. Proceedings of the WFCC satellite meeting. In: Kirsop, B and Hawksworth, D eds. , editors. The Biodiversity of Microorganisms and the Role of Microbial Resource Centres. Prag: IUMS, 1994. p. 37.-43. Fritze, D and Weihs, V , ; Systematics and legislation. In: Priest, F and Goodfellow, M eds. , editors. Applied Microbial Systematics. London: Chapman and Hall, 2000. p. 447.-469. Fritze, D and Weihs, V (2001). Deposition of biological material for patent protection in biotechnology. Mini-Review Appl Microbiol Biotechnol 57: 443–450. IATA – International Air Transport Association.. Dangerous goods regulations. 47th edition. Montreal – Geneva: IATA. 2005. MOSAICC2001. (Micro-Organisms Sustainable Use and Access Regulation International Code of Conduct), Belgian Federal Science Policy Office. www.belspo.be/bccm/mosaicc/index.htm. OECD2001. Biological Resource Centres – Underpinning the future of life sciences and biotechnology (http://oecdpublications.gfi-nb.com/cgi-bin/oecdbookshop.storefront). OECD2007. Best practice guidelines for BRCs (www.oecd.org/sti/biotechnology >Publications and Documents). TenKate, K and Laird, S. A. , . Commercial Use of Biodiversity: Access to Genetic Resources and Benefit-Sharing. London: Earthscan. 1999. UN1993. Convention on Biological Diversity, UNEP/CBD/94/1, 94-04228. WFCC – The World Federation for Culture Collections (www.wfcc.info). WFCC1996. Background document: Access to ex-situ microbial genetic resources within the framework to the convention on biological diversity. UNEP/CBD/COP/3/Inf. 19 information document. (http://wdcm.nig.ac.jp/wfcc/InfoDoc.html). WFCC. Guidelines for the establishment and operation of collections of cultures of microorganisms. 2nd ed. 1999. (http:www.info.org). WFCC2008. Access and benefit sharing, a microorganism perspective. Ed. D. Smith, President of WFCC & Ph. Desmeth, Secretary of WFCC. http://www.wfcc.info. WHO2004. WHO Laboratory safety manual (3rd ed; WHO/CDS/CSR/LYO/2004.11). WHO2006. WHO biorisk management laboratory biosecurity guidance; WHO/CDS/EPR/2006.6). 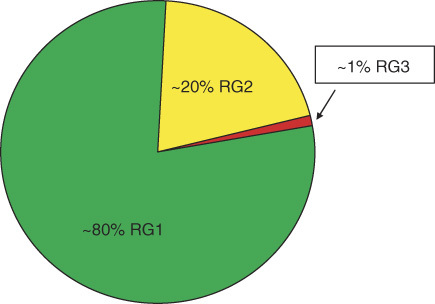 Percentages of Bacteria allocated to Risk Groups 1, 2 and 3. Percentages of Fungi allocated to Risk Groups 1, 2 and 3. Collections of living biological material: Hubs of interest. Examples for legislation and regulations affecting collection work (left, blue) and examples for potential and prescribed uses of the biological material (right, red). Problem of ‘multiple ownership’ of microbial cultures.